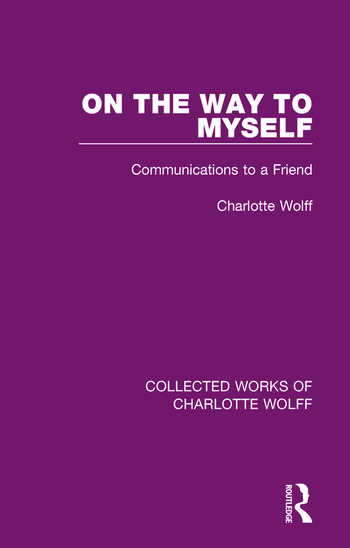 Originally published in 1969, Dr Charlotte Wolff was the author of three books of psychology: The Human Hand, A Psychology of Gesture and The Hand in Psychological Diagnosis. This book, though it contains much psychology, is not of the same scientific kind as these. It is an autobiography, but not one of the normal kind. It is the history of a mind, not the chronicle of a life. For this reason it is not arranged chronologically but it is constructed round what the author called the creative shock experiences of her life, some of which belong with their consequences rather than with events adjacent in time. The resulting book is one of imaginative psychology. In the course of a life which began on the borders of Poland and carried her to Germany, France, Russia and England, Dr Wolff had met and known many of the most famous writers, artists and thinkers of the time. In Germany she studied under the founding Existentialists, Husserl and Heidegger; in France she carried out psychological research under Professor Henri Wallon and was also assisted by the Surrealists, André Breton, St. Exupéry, Paul Eluard; in England she was aided in her work by Sir Julian Huxley, Aldous Huxley and his wife, Dr William Stephenson, Dr Earle and others. But Dr Wolff’s earliest creative work was as a poet, and though she turned to psychology, her interest in art brought her into touch at different times with Ravel, Virginia Woolf, Bernard Shaw, Lady Ottoline Morrell, Thomas and Heinrich Mann, Baladine Klossowska and many more. Dr Earle wrote of her that she is ‘an artist of psychology’, and it is thus that she appears in this odd and fascinating book. Today it is an interesting glimpse in to the life of an early feminist psychologist. Her later research focused on sexology, her writing on lesbianism and bisexuality were influential early works in the field. Preface. Introductory. A Diary. In Danzig. In Paris. In Search of Inner Peace. In London. In Paris and London. A Journey into Russia. Flashes and Reflections.